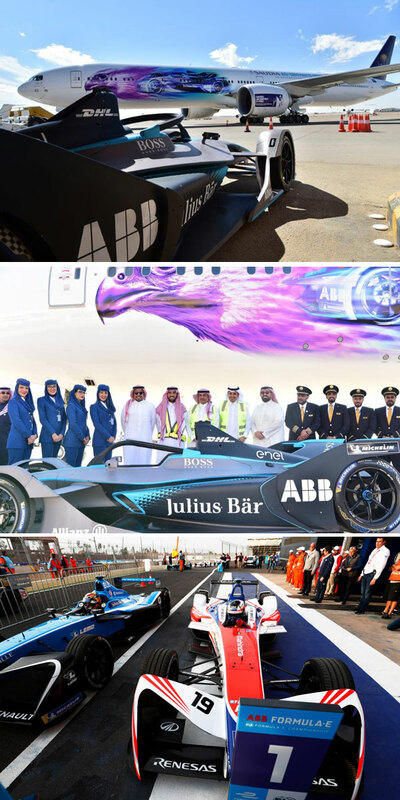 National flag carrier Saudia has unveiled the dramatic new racing livery for the historic 2018/19 ABB FIA Formula E Championship which makes its Middle East debut at a stunning Unesco heritage site on the outskirts of capital Riyadh. Saudia is the official Title Sponsor and Airline Partner of the Ad Diriyah E Prix, the first race of the 2018/19 ABB FIA Formula E Championship, which kicks off on December 15. The unique aircraft design signifies the airlines long-term partnership with the ABB FIA Formula E as the Official Title Sponsor of the upcoming race and official Airline Partner of the series, which begins this season. The new livery was revealed to special guests and members of the media at an inaugural ceremony at the Private Aviation Terminal at King Khalid International Airport in Riyadh today (December 2), said a statement from the national carrier. This reflects the commitment the airline has made in supporting the all-electric series for the duration of its partnership, it stated. The Boeing 777-300 aircraft with the new vibrant Saudia Ad-Diriyah E-Prix livery design, will fly across four continents across the carrier’s extensive route network of more than 90 destinations. For the first time the airline is able to bring international visitors to the event thanks to a new online visa system called Sharek - https://www.sharek.sa/formulae - which means ‘your ticket is your visa’ for tourists from around the world wanted to attend. So travellers from more than 50 nations around the world have been granted visas, with the UK and US leading the way. The ‘Saudia’ Ad Diriyah E-Prix is the centre piece of a three-day festival of music, entertainment and cultural activities, the like of which has never been seen before. Last week, the organisers had announced that six international artists will be performing on stage at Ad Diriyah. Two superstars will perform on December 13 (Enrique Iglesias and Jason Derulo), two on December 14 (The Black Eyed Peas and Amr Diab), with the final pair electrifying crowds after the Formula E race day on December 15 (OneRepublic and David Guetta). Access to the complimentary concerts is exclusive to Formula E ticket holders with December 13 and 14 starting from SR295 ($78.5) for single day tickets, and December 15 starting from SR395 for race day and concert access. Combined three-day tickets start from SR950. Tickets for the ‘Saudia’ Ad Diriyah E-Prix are available at www.ad-diriyah-eprix.com.